With a varied caseload from my school position and private clients, I am always looking for tools for my toolbox. A few years ago, after many years of purchasing items on TeachersPayTeachers, I started created activities to share and sell. 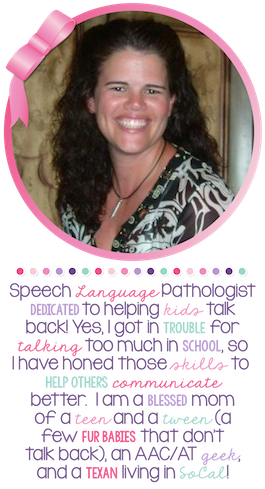 I typically make activities because it is what I need to work with my students and clients. 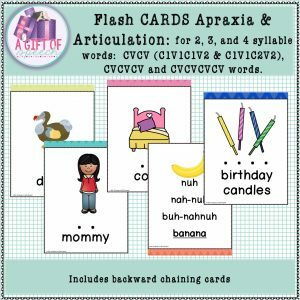 I realized that I needed my own set of cards geared towards my kiddos and my training on how to approach Childhood Apraxia of Speech. So I created a print and digital card set to support my kiddos. They are not an approach but a tool. 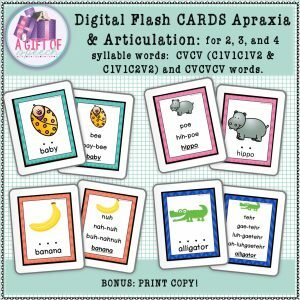 The print and digital card sets include CVCV words with homorganic and heteroganic consonants and vowels (reduplicated and words with vowel/consonant changes). There are also multisyllabic words. Each word contains a card with an image and target. There is also a card for each word with a backward chaining model. With the print version, I can make cards and targets specifically for each student/client. I can also print out multiple sets. Now I don’t have to worry when a student bends or trashes a card from my “expensive set”. With m digital set, I can take it with me to multiple sites. This set will be growing over time. Check out this activity in my store on TeachersPayTeachers! Check out these products in our store on Teachers Pay Teachers.